While at the gas station we chatted with a local about our route. When he heard that we’d be passing through Wabinosh Lake, he mentioned that there was a POW camp from WWII we should check out. He said it was on one of the small islands on the lake – “not the big one”, he clarified. I had visions of Alcatraz Island in San Francisco Bay! Since I had never heard mention of any POW camps for German soldiers in the Armstrong area, I knew we would have to check it out when we got to Wabinosh Lake. During WWII (1939-1945) an estimated 35,000 German soldiers were kept at various Prisoner of War camps scattered across Canada. Since the Allies never did establish a foothold in western Europe until June 1944, the majority – 25,000 or so – of those POWs sent to Canada had been captured in North Africa at battles like those at El Alamein. 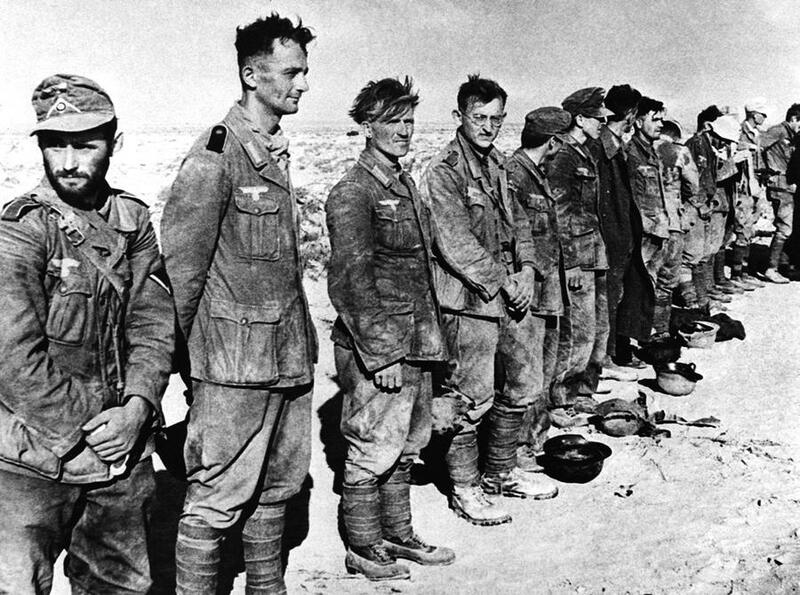 Some of the 97 German prisoners captured by the British forces in Egypt in a raid on Tel El Eisa, Egypt, on September 1, 1942. Where were the Canadian POW Camps? There were twenty-five POW camps in Canada during WWII. [There were an additional fifteen camps holding Japanese Canadians and others whose loyalty was considered suspect – those of German, Italian, or Jewish background, as well as conscientious objectors.] Of the camps holding actual prisoners of war, the two largest in North America were in Alberta – in Lethbridge and Medicine Hat – and housed a total of 25,000 over the few years they were operational. A list of those Canadian WWII POW camps can be accessed here. Click on the image to access the 52-minute documentary. As I watched the documentary I wondered about my father Stanislav and his experience in German POW camps from 1939 to 1945. He was in what was left of the Polish Army in late September of 1939 when he was captured in the streets of Warsaw and hauled back to a camp in northwestern Germany. Only once did he open up and speak about those years. Nothing in the Armstrong area on the list! More research would reveal the reason why! So where is the POW Camp on Wabinosh Lake? 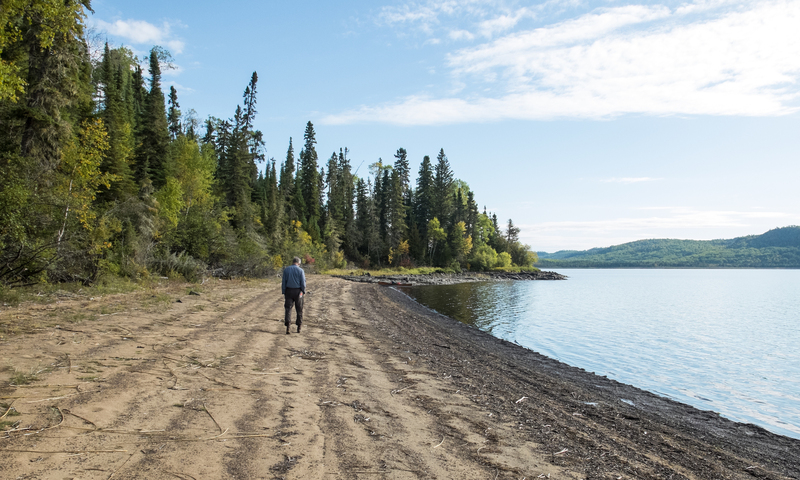 Ten days after our fill-up in Armstrong as we paddled into Wabinsoh Bay, I sent Don Elliot of Mattice Lake Outfitters an email, asking where the German POW camp was located. 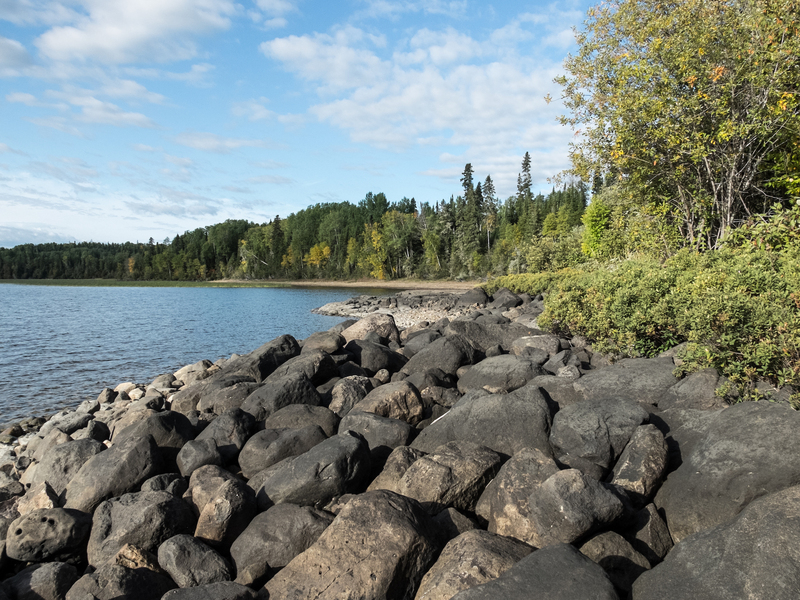 He replied that it was on the west shore of Wabinosh Lake by the river flowing in from Waweig. The west shore is where that small island is. We had some confirmation of the camp’s location! We weren’t sure if he meant to the right or left of the river outlet. Once we were in Wabinosh Lake we headed for the west shore and set up camp on the point shown on the map above. Then we went looking for any evidence of human presence along the shoreline and in the bush behind it. While the area looked like it could accommodate a few buildings, the only thing we found was a 4-meter length of steel cable running down towards the shore. It may be something left behind from some logging operation. The next morning as we headed for the Wabinosh River and the five-portage ascent up into Waweig Lake, we made a diversion to the shore on the north side of the river outlet. At the north end of a long beach area where we landed is an area that could easily have been the site of a camp of some sort – but we did not find any evidence. As we looked north to the top of Wabinosh Lake we could see the small – very small! – island. We considered the possibility of it hosting a POW camp and thought it was pretty pointless, given the size of the island and the fact that you could walk from the island to the shore without getting your navel wet. So much for the Alcatraz of the North! As we would later find out, it was also based on a mistaken idea of how those German POWs were housed. We left Wabinosh lake not having found anything except that length of steel cable at our campsite on the westside point. A couple of weeks after our canoe trip, I happened to be rereading a bit of Kevin Callan’s Dazed But Not Confused: Tales of A Wilderness Wanderer when this brief passage jumped out at me! Looking at the map (see below), I could see a creek that fit with Callan’s description. I thought that maybe we hadn’t found anything because we had been looking in the wrong place! However, given how remote any place on the west shore of Lake Nipigon was between 1939 and 1945, I did wonder why a location two kilometers up this particular creek was felt to be necessary for this POW camp! 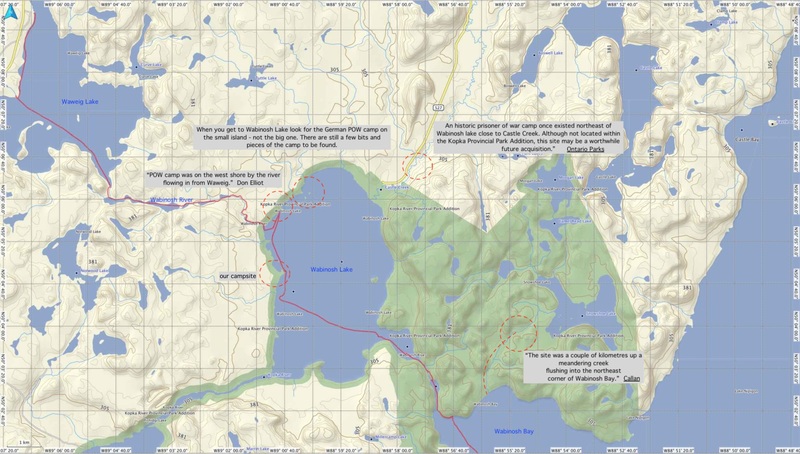 Since there was no Highway 527 (or its logging road original) until the 1950’s, the only way to bring in the POWs to Wabinosh Bay or Wabinosh Lake would be from the CN tracks which pass through Armstrong or by boat from the south end of Lake Nipigon. This information from a 2001 Ontario Parks document helped make sense of Callan’s location. Callan’s location agrees with the Ministry document if you change his “northeast corner of Wabinosh Bay” to “northeast corner of Wabinosh Lake“. It seems more likely that Callan and his paddle partner went up Castle Creek to the site mentioned in the Ontario Government Ministry document. Castle Creek certainly meanders in a way that the creek above Wabinosh Bay does not. There would be no confusion if he had just mentioned the name of the creek in his account! Had we known about the Castle Creek location of the POW camp we might have checked it out to see what was there. Maybe next time! In the meanwhile, if you’ve been there, feel free to drop a line in the comment section below and describe what you saw! So What Exactly Was At The POW Camp Location? The area once housed a small city of canvas and wood huts stacked tightly a few meters back from the creek and surrounded by triple-layered barbed wire. Given that they only found bits of metal and the remains of three log cabins at the site, it is likely that he has imagined something more than what was actually there. What Callan saw at the site – the remains of three cabins – may be the sum total of the buildings that made up the camp. Perhaps they were supplemented by one or two of the buildings on skids mentioned in the Pierre Parent comment above. In the end, what was there was almost certainly a temporary logging camp and the POWs had relative freedom to move about. 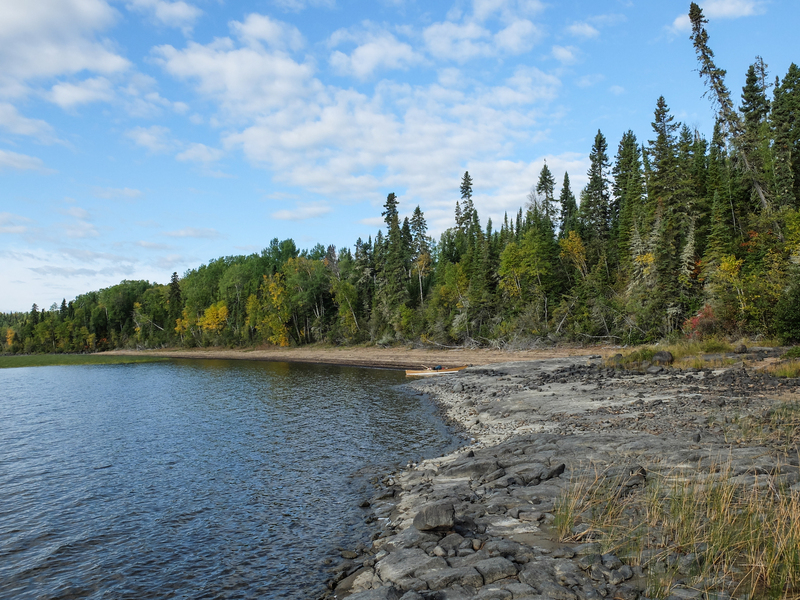 The two spots on Wabinosh Lake that we visited – the one we camped at and the one we paddled to the next morning – are probably the two sites referred to in the Ontario Parks document, though we did not see the remains of any cabin foundations. All we saw was that length of steel cable up from the shore of the point near our campsite. Either site could have hosted a temporary logging camp where German prisoners provided the labour. The Castle Creek site mentioned in that same Ontario Parks study – and probably by Callan in his Dazed But Not Confused: Tales of A Wilderness Wanderer – is a third site that may have been used. From one year to the next, logging operations may have been shifted from one side of the lake to the other with those buildings on skids hauled over the ice to the cabins whose foundations mentioned by both Callan and other sources. My initial sense of amazement that there had been POW camps in the Armstrong area has been tempered by the reality that they were no more than temporary lumber camps where the German POWs provided the labour and enjoyed a certain amount of freedom. In a sense, we spent our time looking for something that was never there! 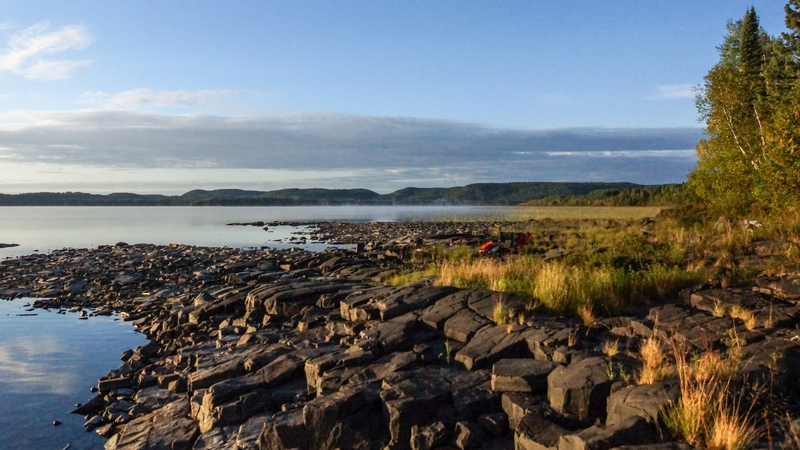 It made for an interesting tangent to what was a multi-faceted canoe trip involving pictographs, logjams, and paddling the big water of Lake Nipigon. We’ll be back for more! To add a bit of context, the POW bush camps you are referring to belonged to the Nipigon Lake Timber Co. Long story short, in May 1943, the Canadian government approved the employment of POWs by civilian employers in agriculture and bush work. By the end of the war, there were almost 300 labour projects, most of which were remote and lacked the traditional security measures of internment camps. Of these, over 100 were bush camps in Northern Ontario employing POWs. According to my records, Nipigon Lake Timber Co. had three camps in the Wabinosh Lake/Armstrong area employing a total of 200 POWs from 1945 to 1946. The POWs worked 8-hour days, six days a week for $0.50 a day, doing the same work as civilian woodcutters. 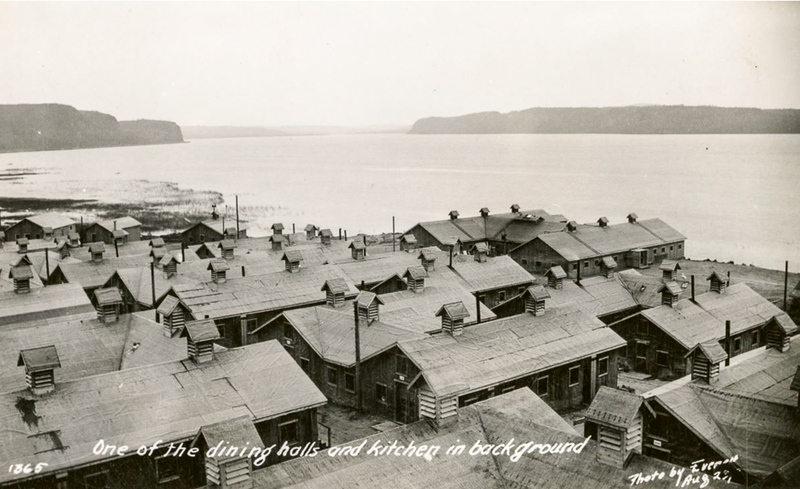 The camps would have be no different than those employing civilians and often included separate bunkhouses for POWs, guards, and civilian staff, an office/canteen, a kitchen and mess hall, barn, and blacksmith shop. Click on the header above or on the following link to see more of his research on POWs in Canada or ot get in touch with him. An article at the TV Ontario website – Daring escapes and Canadian hospitality: Inside Ontario’s WWII prisoner-of-war camps – provides a readable introduction to the topic. 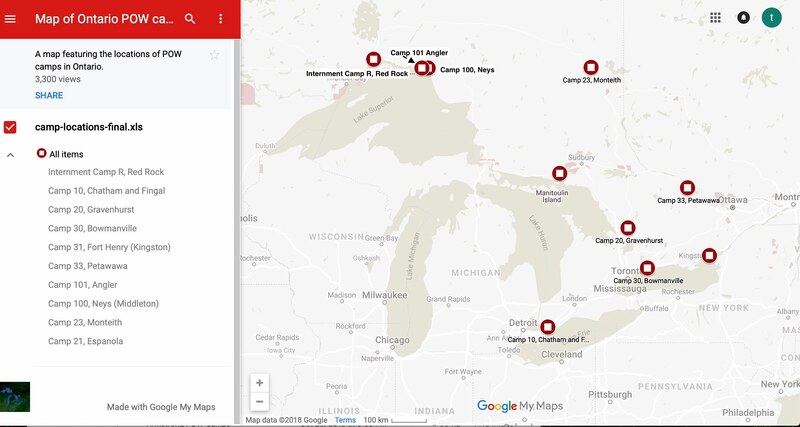 It is also where I found the map of the 10 Ontario POW camp locations and the photo of the Red Rock Camp. Click on the header to access the webpage. There are references to a number of camps in the Armstrong area. A careful reading of the material would probably turn up more leads to other site locations. I just skimmed through looking for anything that seemed to connect with Wabinosh Lake. The Wartime Memories Project website (click on the header to access) has a list of both Axis and Allied POW camps across the globe. 3 Responses to WWII POW Camps in the Armstrong Station Area – The Real Story! Thanks for this bit of history! I study WWII extensively (was a small child in France during the Occupation) so I found the POW camps in Canada interesting. I’ll be looking up some more history. Very interesting and I thoroughly enjoyed The Enemy Within documentary.